Fritz Lang’s silent movie epic with an original soundtrack was performed live to two sold out audiences on March 22 and 23 at the Louise Hopkins Underwood Center for the Arts. 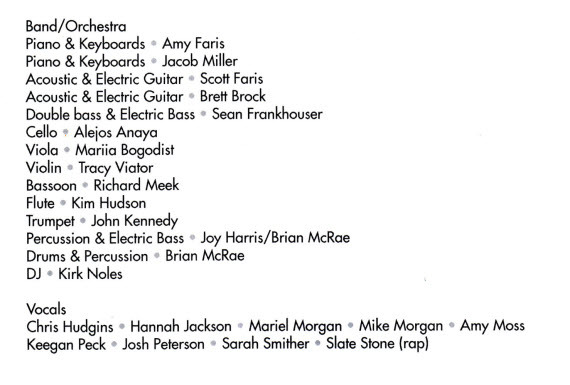 The music was written by Scott & Amy Faris. The film was the opening work of the 2013 Flatland Film Festival. Metropolis is a landmark in the history of motion pictures. Filmed in 1925 and released in 1927 it was soon eclipsed by talking pictures. It received mixed reviews was cut and parts of it lost. Most of the lost segments were recently filled in when a nearly complete print of the film was discovered in 2008 in Buenos Aires. A definitive version of the film was re-released in 2010. It was this version that was presented at LHUCA. The film is most noteworthy for its influence on subsequent movies. It’s technological achievements and its handling of large groups are very impressive, but it’s now a museum piece. I can’t imagine anyone not a film buff going to see it just for its entertainment value. The draw last weekend was the music. The performers are listed below. As can be seen there were a lot of them and they were all amplified. I cannot comment with any expertise about this type of music other than to say it appeared well performed and executed. It was in perfect sync with the movie, so much so that it almost seemed embedded in the film. It was loud to the point of pain and incipient deafness. I spoke to some of the audience (during the intermission) who assured me that this was the norm for this type of music. I only got through the show by retreating to the bathroom and grabbing a couple of paper towels. I tore them into small pieces and stuffed them in my ears. Thus equipped I was able to survive the performance without permanent 8th nerve damage. The hearing aids of the gentleman seated to my right began to emit noises reminiscent of the Twilight Zone (I only noticed during a pause in the action), then disembogued pulsing lights toward the ultraviolet end of the spectrum, and finally popped out onto his lap. The level of both the instrumental and vocal performances was very high – at least as far as I could tell given my unfamiliarity with this kind of music. I couldn’t make out the words to the numerous vocals during the 146 minutes of the film, but they were delivered with elan and enthusiasm. The audience was wildly enthusiastic. The composition and arrangement of the music for this film was a major project that was conceived and executed at the highest professional level. I greatly enjoyed the show and would recommend you attend if it’s repeated – just bring ear plugs. The lady to my left must have been a veteran of this art form because she had her ear plugs installed before the first note was played. My only problem was getting the paper out of my ears after the music ceased, but a trip to the emergency room fixed that – after a 3 hour wait. Be prepared is now my motto. I rented Metropolis several years ago. I don’t remember any music. I may have turned the sound off as I do for many silents. Most silents have such lousy music…just something slapped on. But the score by Niti Sawhney for the exotic India made Throw of Dice is just wonderful..nothing distracting and often enhancing the visual. I wish he had done The Indian Tomb, my favorite silent, full of repetitive, copied, tinny “music” without reason……..for 3 1/2 hours!!! Another favorite is The Man Who Laughs with fairly suitable music expressly composed at the time, in fact, hoping to have a hit song. I’m hoping Rasputin, Demon with Women, will emerge with English subtitles and with the bonus of suitable music.